Every weed trimmer on the market can be adapted to use Weed Tiger trimmer line in less than three minutes installs in seconds. Custom manufactured to .145+/- gauge highest quality nylon material available. Fixed length bright yellow trimmer line is easier to see and prevents the hassle of too much line. 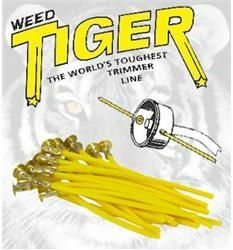 There is no pounding required for Weed Tiger trimmer line. Just slip in a new Weed Tiger trimmer line and it last and lasts.